There comes a time in everyone's life, when you have to pay heed to what has been simmering away in your heart for years, which is why we have put everything to one side (other than our online painting tutorials) to concentrate on the second book in 'Paul Taggart's Elphen Chronicles' - the highly illustrated story of 'Webstrand - the Tooth Gatherer'. Fifteen years in the writing, painting and designing, now gathering speed as we head towards our release dates for the various elements included in this project. As many know, we privately published and sold the first book exactly twenty years ago, as a signed and numbered Limited Edition; quite an undertaking for us both, as it required everything we had, both financially and in terms of commitment. Book One contained a dedicated collection of full-plate original watercolour paintings and chapter heading line-drawings that inspired the story; which, in turn, influenced and inspired the paintings – a continuous circle, or chain, of indivisible links. We have never offered these paintings for sale, neither when Book 1 was originally published, nor to anyone since. They have been securely tucked away in the Elphen portfolio; but now it is time to set them free, so that they can play their part in helping us to tell the story of ‘Webstrand, the Tooth Gatherer’. 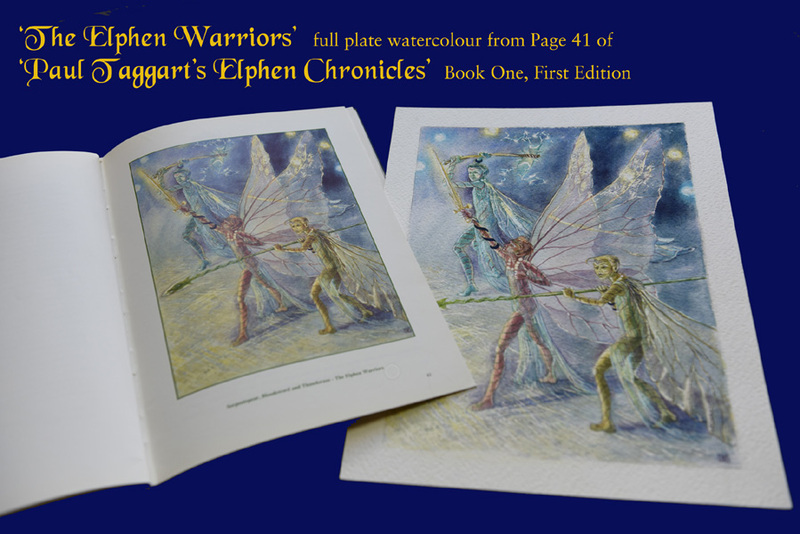 If you would like to know more about the original watercolour paintings produced for these full-plate illustrations in Paul’s first Elphen Chronicles book, such as ‘The Elphen Warriors’ shown here? Simply pop over to our Current Projects Gallery where you will find full details(click here - http://www.artworkshopwithpaul.com/gallery2.php?GalleryID=5). As you may know, from our previous communications, we have already started to release various behind-the-scenes ‘Watch & Wander through Paul Taggart’s Elphen Chronicles’ online videos and Bonus Features, many more of which are in the making as we write, including a hint of what is to come on the music front – the ‘Elphen Soundscape’. A dedicated Elphen website is work-in-progress, as is our video-book ‘Watch & Listen to Paul Taggart’s Elphen Chronicles’, which we intend to release ahead of the ‘hard copy’ book (the ‘Artist’s Legacy First Edition’). 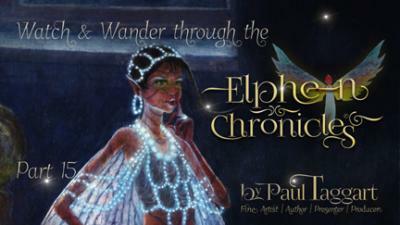 ‘Elphen Chronicles’ is, for us, a legacy project – Paul’s principal collection of very large Masterworks oil paintings, which appear as full-plates in ‘Webstrand, the Tooth Gatherer’ harness the very best of traditional oil painting techniques and have been five or more years in the making. In addition to those, Paul has developed a unique Line, Tone & Glaze method, again based on traditional techniques, for his ever-growing collection of ‘Storytelling Vignettes’ that scatter through the entire book. 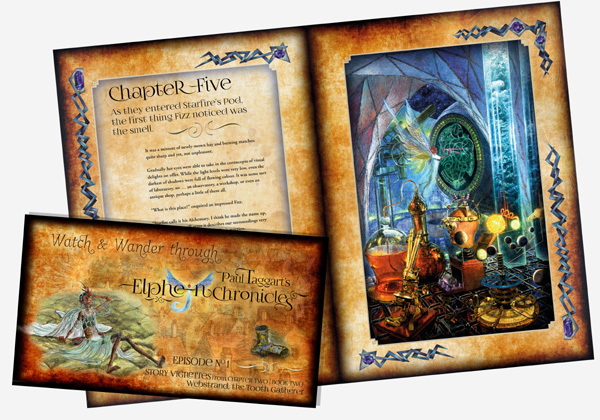 The first videos in Chapter 2 of ‘Watch& Wander through Paul Taggart’s Elphen Chronicles’ is nearing completion and we’ll be sending out information about those shortly. We would be delighted to send you a unique and personal code to watch-for-free one of the videos in Chapter 2 when they become available. Your first step is to ensure that you are registered on our official website. Then we will be in touch for Step 2. The closing date for viewing the video of your choice is September 30 2017 – so please don’t delay in letting us know that you would like your personal code.